The snow blew through the trees, shaking the branches and rattling the windows of the house. Mary curled up in a ball under her blankets. "I'm so glad I don't have to go outside today. Brrr. It's freezing out there." She closed her eyes and tried to fall back to sleep. "If I just ignore my mom and pretend like I don't hear her, maybe she'll leave me alone." Mary pulled the covers over the top of her head. "Mary! It's time to wake up. You've got to take Sniffles for a walk." "I don't want to take Sniffles for a walk in the snow. I'm going to ignore my mom again. Maybe she'll just do it." Mary kept her eyes shut. Her bedroom door opened wide. "Mary! You have to get up now. Breakfast is ready and Sniffles is anxious to go outside. He's your dog." Mary's mom pulled the covers off of Mary. "Get up!" Mary whined. "I don't want to." "You might not want to, but you have to take Sniffles. He's standing by the back door waiting for you. You can eat breakfast first." Mary's mom stood at the bottom of the bed tapping her foot. "If you don't want to take care of Sniffles any more then I will have to take Sniffles and give him to someone else; someone who will take care of him." She closed the door and went into the kitchen. Mary lay in her bed. "I don't want to get up. It's too cold. What if Mom gives Sniffles away?" Mary pouted and climbed out of bed. She put on her clothes and boots. "All right, Mom. I'll take Sniffles for a walk." She sat on the kitchen chair and ate her scrambled eggs and toast. 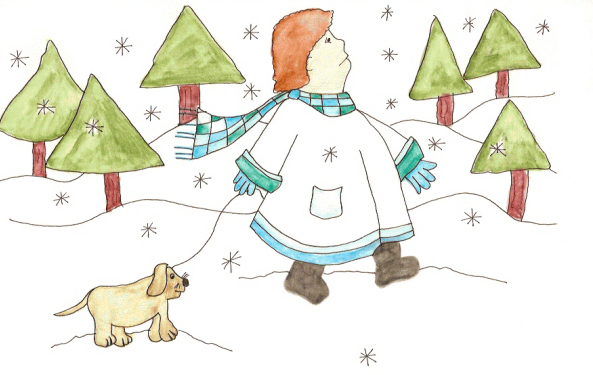 When she finished, she put on her scarf and coat and put the leash around Sniffles' neck. She opened the door and a cold blast of air blew on her. "Brrr." Sniffles barked and ran around in the snow, trying to catch snowflakes. They walked through the forest and over the hills. At first Mary didn't look at Sniffles. She didn't laugh at him or try to be happy, but when Sniffles dug a hole in the snow and went inside and barked, she couldn't help but laugh. "Oh Sniffles, I love you. I'm sorry I wouldn't take you for a walk." She stroked her dog and then finished the walk. When she arrived back at home, Sniffles ran and lay in front of the fire. Mary was chilled to the bone and was looking forward to a cup of hot cocoa. "Mary, you need to go and clean your room." Mary's chin dropped. She didn't want to clean her room. She wanted a cup of hot cocoa. "I don't want to, Mom." "You may not want to, but you have to. Your room is a mess. I can't even get in the door to put your clean clothes in your drawers. After you've finished cleaning your room you can have a cup of hot cocoa." "I don't want to clean my room. I want my cocoa now!" Mary pouted and went to her room. She sat on her bed and didn't pick up on thing. "I'm not going to clean my room. I'm going to play with my toys." She looked on the floor and couldn't see any toys. All she saw was dirty wash and papers. "Maybe Mom is right. My room is messy." She sat on the floor and picked up all the wash and put it in the basket. She put the papers into the trash can and then she saw her toys. Some of them were broken because she'd stepped on them. With a sigh she cleaned the toys. Soon her room was clean. After her mom had come in and seen how clean it was she fixed Mary a cup of hot cocoa. "Mary, I want you to..."
"No! I don't want to," Mary said, before her Mom could finish the sentence. "I was going to ask you to help me make some chocolate chip cookies, but if you don't want to." "Oh. I do want to, Mom. Let's make some," Mary said. "I'm sorry, Mom." They spent the rest of the day baking and Mary got to lick the spoon.